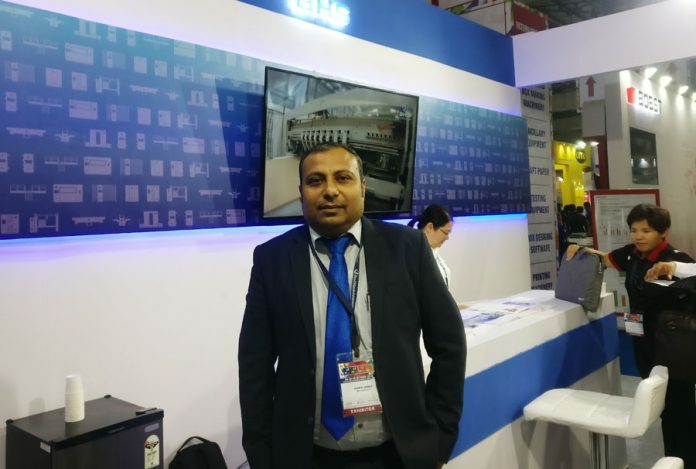 Germany-based manufacturer of corrugation machines, BHS Corrugated has managed to rapidly increase its installation base in India and expects to grow even faster in coming years, Bijendra Sharma, managing director, BHS Corrugated India said during the IndiaCorr Expo, which was held in Mumbai in the first week of October. Mumbai-based Horizon Packs will be installing two machines, Gujarat-based Adani Wilmar will be installing one machine while another corrugator will be going to an undisclosed firm. “Horizon will install two Steady Line corrugators while Adani plans to opt for an Eco Line corrugator. The fourth line will also be an Eco Line. I would not like to disclose the name of the firm at this stage,” Sharma says. The Eco Line is available in 1,800 mm width and has a production speed of 150 meters per minute while the Steady Line is available in 1,800 mm and 2,200 mm width. The Steady Line has a cruising speed of 180 meters per minute. The Steady Line S can run up to 230 meter per minute. According to Sharma, with the rise in demand for corrugated packaging in India, top corrugated packaging solution providers in the country are opting for the best technology available and that is why demand for solutions from brands like BHS is also expanding. Additionally, Sharma says, that availability of capital from financial institutions is also making investment in high-end corrugators much easier for entrepreneurs. Another reason is that Indian companies are now aware of what is going on in the world in terms of technology. “Information about technology is easily available in this age of internet and Indian companies know what developments are taking place globally,” Sharma argues. With BHS Corrugated’s customers growing in India, it wants to service them quickly and effortlessly. And that is why, Sharma discloses, the company intends to set up a corrugating roll manufacturing unit in India. “At present we supply rolls to Indian customers from China and the whole delivery process takes almost five months. We want to cut this lead time significantly and that is why we have decided to manufacture rolls in India,” he says. The manufacturing unit is expected to be ready by end-2019. “The process has started, and we are going to finalize on the land soon. I cannot say anything about the location of the plant yet. But I can tell you that the plant will be ready by end of next year,” Sharma concludes.